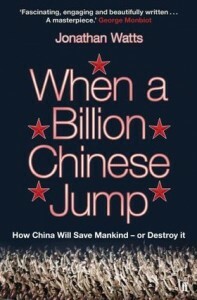 My review of Jonathan Watts’s book When a Billion Chinese Jump for China Today. This was written in Chinese and later translated into English. THE book’s title comes from a childhood experience of its author in the 1970s. On learning the concept of one billion, he was introduced to the nation with a population of that size, and warned: “If everyone in China jumps at exactly the same time, it will shake the earth off its axis and kill us all.” After that whenever he prayed for family and friends at night, he would usually sign off with the plea: “Please make sure everyone in China doesn’t jump at the same time.” Thirty years on, the boy who used to worry about the fate of mankind was a journalist on a respected British newspaper and did come to China. Jonathan Watts was a reporter for the London-based Guardian, and that newspaper’s correspondent in Japan before being sent to China in 2003. The rocket-fueled economy and dramatic transformation in the social environment attracted him to the country – this was where it was all happening. Living in China reminded him of his childhood fear that a billion Chinese are jumping at the same time, but instead of jumping the fear is now of them embracing Western consumerism. A billion Chinese jumping simultaneously might produce a small earthquake, but if they all followed an American lifestyle, the resources consumed and the ensuing environmental damage would lead catastrophic destruction. Guardian’s Jonathan Watts, when reporting the dust storm in northern China, introduced us to this excellent blog, livefrombeijing, by Vance, an American engineer working on clean transportation for China. Vance’s blog explains the environment and emission related data rather well while providing useful insight.